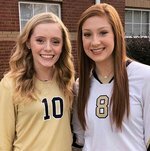 Congratulations to H. Calhoun and K. Warrick for making the Dothan Eagle Super 12 Volleyball Team. Calhoun & Warrick are both seniors at Goshen High. Go Eagles!